Instead of my typical Friday Randomness post, I am joining Emily Freeman of Chatting at the Sky again for her end of the month post where she invites other writers to come along and share what they learned the past month. My last post from the love dare series spoke to how love is not irritable. Two reasons for being irritable are stress and selfishness. My eyes have been opened recently to the expectations I place on myself which lead to stress, which leads to being irritable. When I look at my expectations it has much to do with selfishness. The writers of The Love Dare book are rather wise I'm discovering. Through my discoveries, God taught me a thing or two (or eight) in May on choosing to give myself grace. 1) Grace to know it’s okay if I do not meet my goal of reading through the Bible this year. He cares more about my desire to know Him better and spend time with Him. He loves how my mornings currently begin with the Seeds of Spring reading plan through YouVersion, time in a devotional, or searching out verses speaking to me through my love dare series to better understand God’s kind of love. My goal to read through the Bible is just that: my goal and not necessarily His. 2) Grace to know it’s okay if I do not write out His graces every day in my gratitude journal. It’s even okay if I go several weeks without writing them down. He knows my heart. He knows not a day goes by when I'm not grateful for who He is and for how He has transformed this heart of mine. Gratitude can be shown in many more ways than through a list. 3) Grace to know it’s okay if I am not a perfect wife, mom, daughter, sister or friend. Perfection will never be found this side of heaven. He cares about my willingness to allow His light to shine through the cracks as He refines me to become more and more like Him. 4) Grace to know it’s okay if I am sad over the decline in readers of my blog as long as I do let the numbers define my worth. My worth has already been found in Him. He cares about my willingness to obey the call to write and He will bless me for my yes. I need to trust Him with who does or does not read the words He places on my heart to share. 5) Grace to remember He never asked me to be superwoman. I cannot be all things to everyone. I need to first and foremost be His. 6) Grace to know He doesn’t call the equipped; he equips those He calls. He will give me everything I need to encourage a group of military wives these next six weeks through the (in)couragers community groups. While I do not experience all the same challenges as a spouse of a reservist, He cares most about my heart to encourage them. 7) Grace to remember “He is always good and I am always loved” (Ann Voskamp). 8) I choose to give myself grace because His grace is enough and in admitting my weaknesses, I affirm God's strength (2 Corinthians 12:9). Wishing you grace upon grace. Yes I do, friend. These words from a song are playing in my head.... "I'm breathing in Your grace and breathing out Your praise." I think the song is titled, "Your Great Grace." I'm just left in awe. Hugs to you, Linda. I'm so grateful for you. Thank you for stopping by, Jacey. The upgrade version truly is worth it. So many more options! Blessings to you. Oh how we need to extend God's grace to ourselves. I find that I am good at extending grace to others, but withhold it from myself. God does not want me, or you, to be left out. He does not require us to be perfect...He just wants us to be His. I have had to learn not to let my blog readership determine my worth, or any other worldly measuring stick for that matter, You are worthy just because He loves you...and I love you too...just for being YOU!! It is easier to extend grace to others, isn't it? And we need to extend grace to others but I think once we extend grace to ourselves we are freed up to love on others more. Satan really loves to try and use those blog numbers but every time I look at them I say those words from Jennifer Lee's book . . . "I am already pre-approved." Thank you so much for stopping by, Nannette. It's always wonderful to see you here. Blessings to you. I like that we both wrote about grace! You have me laughing. Thank you for that!! And thank you for stopping by. Blessings. Grace upon grace! Oh, sweet Beth, His word is healing you - I can see it! Have a blessed Friday! Hugs to you, sweet friend. I'm just so grateful for you. Thank you for the encouragement and LOVE. beth, your Grace list is beautiful. thank you for sharing! and picmonkey is definitely worth the paying for the full version! Thank you for stopping by, Caroline. Blessings. 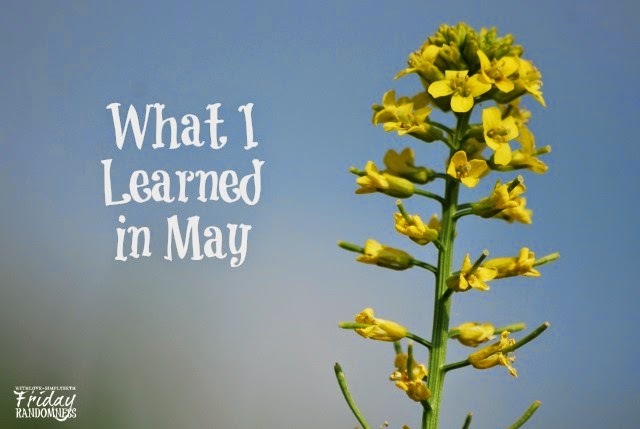 I love your list of what you learned in May. With God's grace we can! You are an encourager to many, and I know the (in)courage group is blessed to have you lead them! Be encouraged, Beth! I'm amazed as I've watched you, (via your writing), grow in God's grace by leaps and bounds. Your comment truly blessed me, Elizabeth. THANK YOU. Oh friend, always so encouraging. I needed #4 on your grace list, about the writing and those who aren't reading. I've really been struggling, wondering why some have disappeared, vanished to be seen no more. But I have to give grace to the reader, as well as receive it for myself. Oh how I do hope He will allow me to keep writing, all for His glory. You said something that is sticking with me, Barbie. We need to give grace to the reader too. There can be so many reasons that is keeping them from getting by. And just like the place we've found ourselves in, sometimes we need to pull back. I'm holding you close in prayer, friend. Love you so much. Grace, oh yes. You definitely need to extend it to yourself. Always, but especially right now, you are going into a long hard stretch of waiting. Oh, and I LOVE picmonkey, I think I need to do the full version and pay! Yes... go get full version! It really gives so many more options. You won't regret it. I promise!! Love this! I smiled at #5 because I too love PicMonkey and teared up at #10. I think I said "AMEN" to the 8 ways He gives you grace. Such a beautiful heartfelt post! Blessings! Love you Beth! This is so wonderful. I love all things you learned, every single one. May you be blessed this weekend as the Lord continues to comfort your heart while your husband is gone. So glad you got to meet 3 online friends. How fun! Your heart for Jesus shines through and it makes my heart sing with gladness. I'm glad to hear you've chosen to give grace to yourself. Don't get mired in legalism and lose the most important thing which is relationship with the Lord...I love the Life Application Bible, too. Thank you for stopping by, Laura. Always a delight to see you here. Blesings. Beth, so much said here is all so familiar to me too. I think about numbers, about speaking before others, about not doing quite the job I thought I should be ABLE to do, etc., etc. Yes, He equips those He calls and He grows us while we follow Him. He loves us no matter what. I am glad I came by, Beth. I'm so glad you found the freedom to just spend time with God, however He leads you to!! What freedom! What grace! Thanks for sharing this grace list, Beth! Blessings! Thank you, Anne. I enjoy seeing you here and plan to get by to visit you more often. I'm grateful we have connected. Blessings. Love your graces and needed to hear some of them myself! Also love PicMonkey!! :-) Have a beautiful Sunday! Thank you sweet friend. Love you. I am a HUGE fan of PicMonkey. I use it all the time, and as you say, it's definitely worth upgrading! I had to laugh with your lawn service, I think we could do with one of those!! Thank you for the invite, Catherine. I will be sure to stop on by to visit you and check out your Marvelous Monday link-up. I'm doing fewer link-ups through the summer but I do want to come see what you are up too. :) Blessings. Thank you for what you wrote about grace, I tranlated it into my own language and it touches me so. Thank you for your kind words, Jedidja. Blessings. I have also discovered picmonkey. Could you tell me why you think paying for the full version is worth it? What do you love about it? I have been using the free version. Thanks! Kathleen, There are many more options with the paid version . . . lots of fonts and creative add-ons which allow you to do so much more with your photos. I think when in the free version it shows you with a crown what else you would be able to do with the paid version. As with anything, it's only worth it if you think you would use those options so I would suggest taking a look around at them. I will admit there are tools I have not tried out yet but only because I don't necessarily have a creative eye on what to do with them. Thank you for stopping by. I will be stopping by later to visit you too. Oh Beth - I love this... I love the simple yet powerful list and agree (and have learned and relearned most of those things as well!) Praying for you as you count down the days until your Honey is home again! And this longer list on giving yourself Grace... just so much Amen, my friend! Visiting from Emily's space over at Chatting at the Sky! So glad I stopped by! I choose to give myself grace. Great words that I live by. Wish we could meet in real life! I so enjoyed reading your post! I recently started a year long Bible reading plan, and have struggled with the self-imposed deadline. What a great reminder that my deadline doesn't necessarily match God's! And what an edifying reminder of God's grace. Thank you for sharing your heart, and for letting me take a peak. Thank you for leaving a comment! I love hearing from you and I read every one. Be sure to subscribe to comments or check back as I try to respond to all comments. I also do my best to hop on over to your blog for a visit.